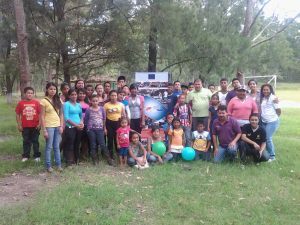 The project, consisting of a set of initiatives, aims to promote the safety of the communities most at risk in Tegucigalpa and San Pedro Sula, creating opportunities and alternatives for young people at risk or in conflict with the law. This became reality through technical and vocational training of young people, improving the educational level of beneficiaries and their families, and promoting the values ​​and experiences that can create a security cordon against organized crime: by scholarships for vocational training, technical training, alternative formal education courses. 525 adolescents and young people involved the guardians parents training courses according to Educatodos methodology. To improve community safety and reduce criminal violence, were carried out community and youth assemblies, public health campaigns, infrastructure works related with security, communal fairs, equipment of the local police station, communication and youth awareness campaigns . To improve more effectively and efficiently the prevention, investigation, punishment and restitution of violated rights processes, training courses on topics of criminal law and investigation directed to legal practitioners have been realized.